Mongolian spots (MS), also known as dermal melanocytosis, are the most frequently seen birthmarks and generally present as large, blue or blue-black macules or patches, mostly limited to the lumbosacral region. They are considered as a benign manifestation; however, extensive MS can be a manifestation of certain underlying inborn errors of metabolism including GM1 gangliosidosis. Mongolian spot is a common benign skin mark present at birth or appears within the first few days of life, which gradually fades and usually disappears by early childhood. However, extensive Mongolian spots involving large areas of the back, trunk, and extremities merit special attention as they can be an early marker of certain inborn errors of metabolism (IEM). Few case reports are available, which cite the instances of IEM associated with extensive Mongolian spots. Here, we describe a case of type 1 GM1 gangliosidosis with extensive Mongolian spots; only few case reports have been reported till date. 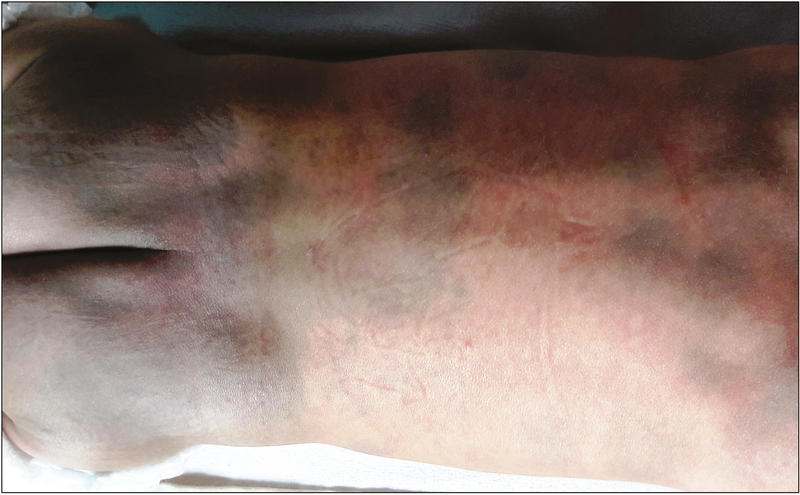 A 6-months-old female child born by second-degree consanguineous marriage presented with developmental delay, multiple bluish-black spots on the body. The mother stated that these hyperpigmented macules were present on the buttock and lower limb since birth, but multiple new lesions also had developed both on the anterior abdominal wall and back, and as the child was growing, the size of the lesion was also increasing proportionally. On examination, these lesions were macular, blue-black with different shapes and sizes ranging from a few millimeters to centimeters [Figure 1]. Her elder sibling died at the age of 2 months because of leucocyte adhesion defect. Examination revealed generalized hypotonia, hepatosplenomegaly, and facial dysmorphism along with flat nasal bridge and long philtrum. Ophthalmological examination showed bilateral cherry red spot. Laboratory results revealed mild transaminitis (aspartate transaminase, 172 IU/L; alanine transaminase, 80 IU/L) with normal bilirubin level. Radiography showed anterior beaking of the vertebrae and bullet-shaped phalanges [Figure 2]. Magnetic resonance imaging (MRI) of the brain revealed subtle hyperintensity of the thalamus, and there was a mixed pattern of myelination [Figure 3]. The diagnosis was confirmed by low level of β-galactosidase activity (1.2% of mean normal) in leukocytes. GM1 gangliosidosis is a rare, autosomal-recessive disorder caused by the deficiency of β-galactosidase, a lysosomal enzyme encoded by a gene on chromosome 3 (3p21.33). It is classified into three types based on the age of onset and clinical phenotype: type I onsets between birth and 6 months, type II between 7 months and 3 years, and type III between 3 and 30 years. The infantile phenotype is characterized by psychomotor delay or regression by the age of 6 months, hypotonia, visceromegaly, cherry red spot in approximately half of the cases, facial dysmorphism, and skeletal abnormalities (dysostosis multiplex) in approximately 80% of cases. Death occurs by 3–4 years of age, most commonly from aspiration pneumonia or cardiac problems. In addition to her neurologic findings, our patient has extensive Mongolian spots. Dermatologic findings are rare in GM1 gangliosidosis. Other cutaneous manifestations such as eczematoid rash, ecchymosis, angiokeratomas, and generalized telangiectasia have been described. Mongolian spots are typically limited to the lumbosacral area; however, in lysosomal storage disease, they are more extensive, often anterior in location, and in addition to its usual posterior site, it is persistent and progressive in nature. Weissbluth et al. reported the first case of extensive Mongolian spots associated with GM1 gangliosidosis. Since then some other cases have been reported linking other IEM and GM1 gangliosidosis. There are 54 reported cases of extensive Mongolian spots with various IEM, in which 25 cases are associated with Hurler syndrome, 17 with GM1 gangliosidosis, 9 with Hunter syndrome, 2 with α-mannosidosis, and 1 with Niemann–Pick disease. 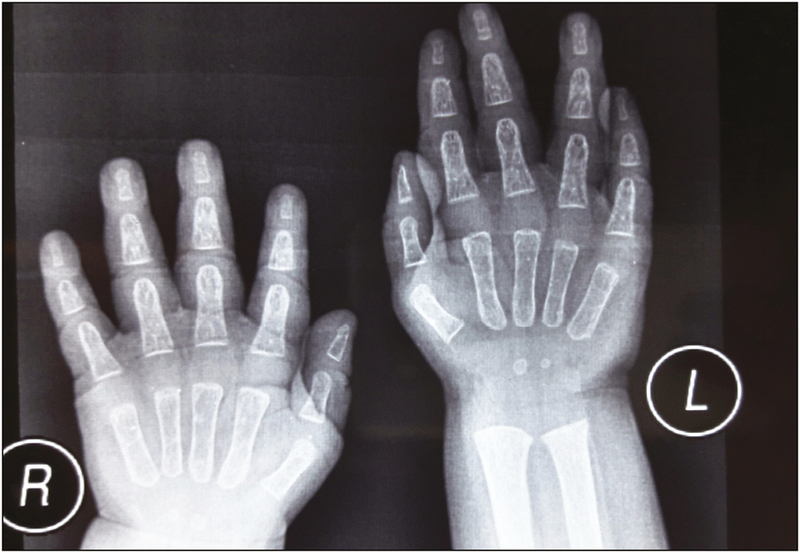 Of these 25 cases of Hurler syndrome, 19 have been reported in a single study by Gonzalez et al. However, in recent years, reporting of extensive Mongolian spots with GM1 gangliosidosis is more frequent in comparison to Hurler syndrome. By 2006, only 39 cases of lysosomal storage disorder associated with Mongolian spots were reported, of these 24 patients had Hurler syndrome and 11 patients had type 1 GM1 gangliosidosis but by now, among 54 reported cases of Mongolian spots with lysosomal storage disorder, 17 are of GM1 gangliosidosis and the number of Hurler syndrome has increased by only 1 to a total of 25. Mongolian spots result from entrapment of melanocytes in dermis because of arrested transdermal migration from the neural crest into epidermis. Melanocyte migration and proliferation are dependent on exogenous peptide growth factors, which stimulate receptors with tyrosine kinase activity (Trk). Human keratinocytes and dermal fibroblasts express nerve growth factor (NGF), which is an important signal for transdermal melanocyte migration. It has been postulated that accumulated metabolites such as gangliosides and heparan sulfate bind tightly to Trk receptor, which enhance NGF activity leading to aberrant neural crest migration producing the large Mongolian spots., In our patient, Mongolian spots continue to develop in an unusual “progressive” manner, which can be attributed to the activation of latent melanocytes. It has been hypothesized that metabolite–Trk binding serves as a trigger to dormant melanocytes resulting in progressive Mongolian spots. Treatment of GM1 gangliosidosis is only symptomatic and not curative. It has been observed that despite complete normalization of white blood cell β-galactosidase levels after allogeneic bone marrow transplantation, the patient continues to deteriorate neurologically. To conclude, Mongolian spots should not be considered as benign birthmark always; it can be a key factor for the early diagnosis of lysosomal storage diseases, especially in the context of developmental delay or neurological impairment. GM1 gangliosidosis does not respond to curative treatment, but early identification is important to provide the family options not only for family planning but also for early palliative care decision. Ziegler A, Guichet A, Pinson L, Barth M, Levade T, Bonneau D, et al. Extensive Mongolian spots in 4p16.3 deletion (Wolf-Hirschhorn syndrome). Clin Dysmorphol 2014;13:109-10. Ashrafi MR, Shabanian R, Mohammadi M, Kavusi S. Extensive Mongolian spots: a clinical sign merits special attention. Pediatr Neurol 2006;13:143-5. Brunetti-Pierri N, Scaglia F. GM1 gangliosidosis: review of clinical, molecular, and therapeutic aspects. Mol Genet Metab 2008;13:391-6. Armstrong-Javors A, Chu CJ. 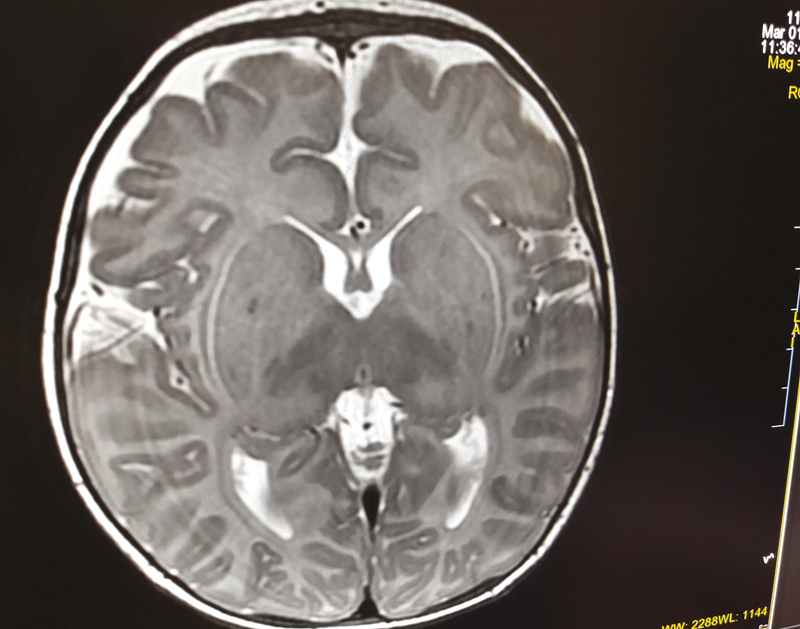 Child neurology: exaggerated dermal melanocytosis in a hypotonic infant: a harbinger of GM1 gangliosidosis. Neurology 2014;13:e166-8. Dweikat I, Libdeh BA, Murrar H, Khalil S, Maraqa N. GM1 gangliosidosis associated with neonatal-onset of diffuse ecchymoses and Mongolian spots. Indian J Dermatol 2011;13:98-100. Hanson M, Lupski JR, Hicks J, Metry D. Association of dermal melanocytosis with lysosomal storage disease: clinical features and hypotheses regarding pathogenesis. Arch Dermatol 2003;13:916-20. Weissbluth M, Esterly NB, Caro WA. Report of an infant with GM1 gangliosidosis type I and extensive and unusual Mongolian spots. Br J Dermatol 1981;13:195-200. Gonzalez M, Arias S, Rolo M, Quero J, Gonzalez N. Manchas mongolicas extensas y el fenotipo de mucopolisacaridosis IH (MPS 1H) muestran asociacion absoluta en dos poblaciones venezolanas. Braz J Genet 1992;13:190. Mutoh T, Tokuda A, Miyadai T, Hamaguchi M, Fujiki N. Ganglioside GM1 binds to the Trk protein and regulates receptor function. Proc Natl Acad Sci U S A 1995;13: 5087-91. Suzuki Y. Chaperone therapy update: Fabry disease, GM1-gangliosidosis and Gaucher disease. Brain Dev 2013;13:515-23.